You are here: Blue Haven > Blog > Blue Haven Pools > Tight Fit? No Problems! You might be tight on space, but don’t discount the idea of your very own swimming pool just yet. Before you rule out the idea completely, it’s best to bring in the experts to advise which pool will fit best with your existing home. Even the smallest of spaces can incorporate a swimming pool, highlighting the architecture of the existing home and integrating the outdoors with the indoors. “A lot of people think that they need an abundance of space to install a swimming pool but that’s not simply the case,” says Blue Haven Pools and Spas Managing Director Remonda Martinez. “Some of our most luxurious designs have been completed in compact spaces, where the design accentuates the existing home and the swimming pool is a focal point of the home. A custom designed concrete swimming pool can be incorporated into almost any space. For a more affordable option though, pre-fabricated fibreglass plunge pools can add a stunning effect to your smaller space. Lap pools are also a versatile option and available in fibreglass for quick and easy installation. Pre-fabricated spas or swim spas are also a great alternative for smaller spaces. Before you hire a contractor and builder, though, consider Remonda’s tips and be on your way to a cool summer. Make sure the pool fits your space properly. Plunge pools are ideal for outdoor areas with limited space and can be designed to resemble a reflecting pond and can be incorporated with water features or cascades to create a relaxing oasis. 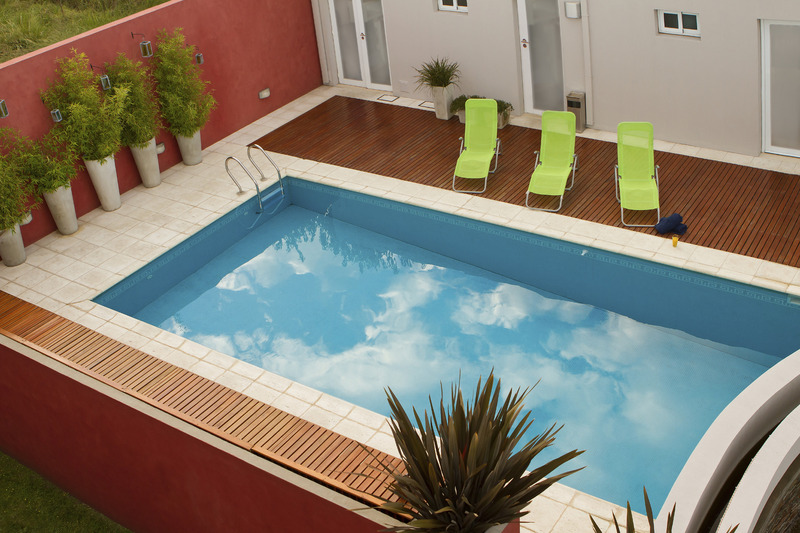 Lap pools work well on narrow blocks and give a modern look with their sharp edges and minimalist style. What direction does your designated pool space face? The best choice is a spot that will receive full sun in the late morning and afternoon. Think about what type of decking or surrounding landscaping you would like – a pool surrounded by a garden elevates the feeling of nature and provides added privacy. While there are many options available for smaller spaces it’s best to start out with a budget in mind. Contact Blue Haven Pools and Spas today on 13 20 25 for an obligation free quote and advice on which swimming pool would be the best fit for your backyard.